How Buffett determines whether the stock market is expensive. How to use interest rates in your valuation. 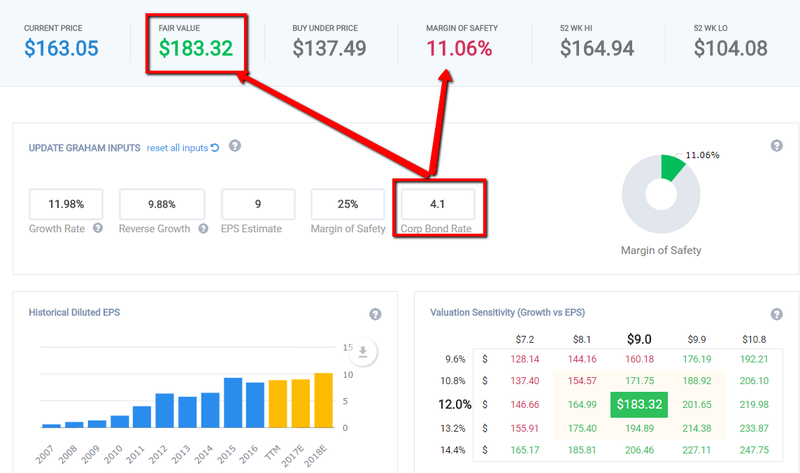 Is AAPL expensive relative to the current stock market? The market is at its all time high. In an interview in early October, Buffett briefly spoke of his yardstick of how he determines whether the stock market is expensive or not. Stocks are not expensive according to Buffett. Rather than just take whatever Buffett says as gospel, let's hear what he said again. Valuations make sense with interest rates where they are... In the end, you measure laying out money for an asset in relation to what you’re going to get back, and the number one yardstick is U.S. government [bonds]. Everything in valuation gets back to interest rates. When talking about stock valuation, Buffett is not referencing the closing price of the S&P. His answer doesn't hinge on stock prices. After all, if you judge by price alone, the market looks frothy. However, what Buffett is doing is comparing valuation to interest rates to get a bigger picture of where stocks are headed. By looking at interest rates from bond markets, he is saying you can use it as a yardstick to determine how relatively cheap the stock market is. He calls the interest rate to valuation concept "hurdle rates". This goes back to the early days when he ran his partnership and in his late 70's and early 80's as he ran Berkshire Hathaway. In its most basic form, a hurdle rate is the lowest acceptable desired rate of return on your investment, but it doesn't have to be a single value. It can vary based on the opportunity. Getting into more details, hurdle rates must factor in the interest rates, inflation and taxes. Question: What is your investment hurdle rate? Answer: 10% is the figure we quit on -- we don't want to buy equities when the real return we expect is less than 10%, whether interest rates are 6% or 1%. It's arbitrary. 10% is not that great after tax. The idea of interest rates is such an important idea that Buffett has said that if there was only one thing he could know about the future, it would be what the 10 year Treasury Yield would be. It's not the market level, who the president is or who the Fed chairman will be. It's what the interest rate is. If rates go up, then market valuation becomes more expensive as the stock market has to justify superior returns relative to risk free rates. Interest rates affect your future opportunity cost. Let's use Apple (AAPL) as an example so that you can see how it all works. An easy formula to gauge how interest rates affect valuation is to use the Ben Graham formula. where V is the intrinsic value, EPS is the trailing 12 month EPS, 8.5 is the PE ratio of a stock with 0% growth and g being the growth rate for the next 7-10 years. However, this formula was later revised as Graham included a required rate of return. Same thing as Buffett's hurdle rate. This second formula is essentially the same except the number 4.4 is what Graham determined to be his minimum required rate of return. At the time of around 1962 when Graham was publicizing his works, the risk free interest rate was 4.4%, but to adjust to the present, we divide this number by today’s AAA corporate bond rate, represented by Y in the formula above. To show you how interest rates affect valuation, we'll calculate two values. One using the 20 year AAA corporate bond rate of 2.93% at the time of this writing, and another using today's 20 year A grade corp bond rate of 4.1%. Let's see how they compare. 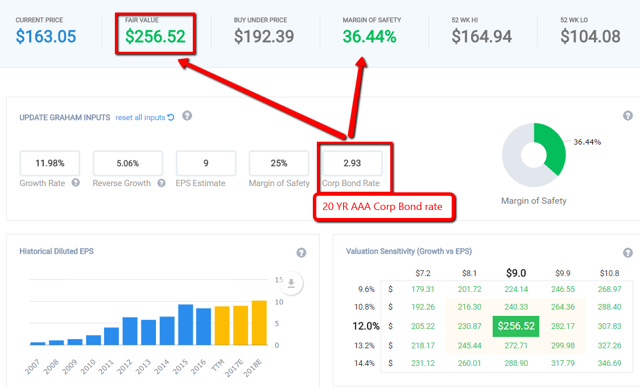 Using the Old School Value Stock Valuation tool, Here is the valuation for the 20 year AAA yield using Graham's formula. When the 20 year AAA yield is used, AAPL's fair value comes out to $256. Compared to the current stock price, the margin of safety is 36%. In other words, low rates make stocks cheap. Re-run the valuation using a 20 YR A rate of 4.1% and it now looks like this. The difference in interest rate has caused the valuation to drop to $183 with a smaller 11% margin of safety. If you view the current interest rate levels as the norm, stock valuations look reasonable. If you believe interest rates will go up higher, current stock valuation is expensive. At the end of the day, it all comes down to buying low and selling high. But how do you know when to buy without knowing the value of a stock? I use 3 valuation models to get different valuation angles. The Graham's Formula uses earnings and interest rates to give an approximate value based on current market conditions. Another approach is to take Buffett's advice by valuing a stock based on its future cash flows. I use a 3 stage DCF for this. The last method I compare against is an EBIT multiples model to check different what if scenarios based on different EBIT levels. This 3 pronged approach provides for a better valuation range and here's how AAPL looks right now. 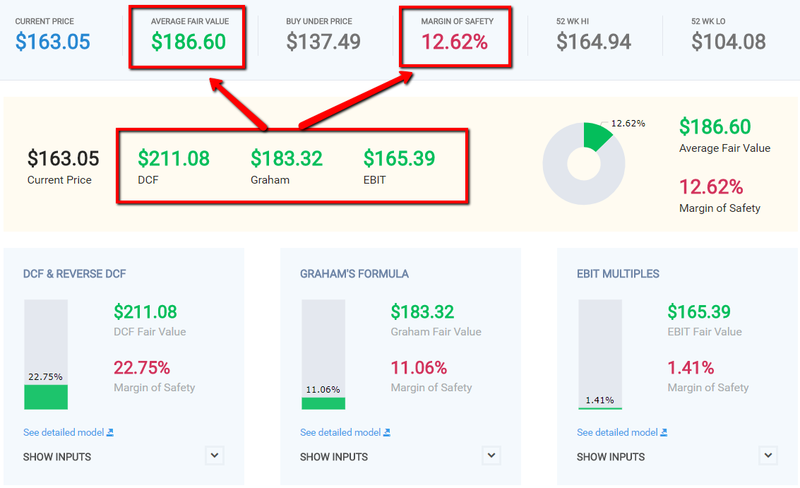 Based on the three valuation models (DCF, Graham's Formula, EBIT multiples), the average fair value for Apple comes out to $186 with a 12.6% margin of safety vs the stock price of $163. Depending on your risk profile, a 12% margin of safety may be too little or around your ballpark figure. But what you see is a range of "what if" scenarios that can take place from $165 (EBIT valuation) to $211 (NYSE:DCF). This fair value range of $50 is quite big, but I believe fixating on a single fair value is dangerous and can lead to disastrous results. Is Apple and Other Stocks Expensive? Sure there are expensive stocks. You'll find them in any type of market. But when looking at the overall landscape, despite the TV chatter that goes on and on about market tops, there's a reason why Buffett says that current valuations are reasonable. When you focus on price as the single factor, it's expensive. Look at the context of interest rates and where you think the US is headed and valuations are ok.
Disclosure: I am/we are long AAPL. I wrote this article myself, and it expresses my own opinions. I am not receiving compensation for it. I have no business relationship with any company whose stock is mentioned in this article.